I received this Gerber Prodigy Survival Combat Knife as a Father’s Day gift from my Kids about 2 yrs ago. Well… to be honest I gave them a list of things to choose from that I wanted and they chose this…lol. I wanted a good all purpose knife for survival, hunting, and if needed combat. This is what I have found. it is the little brother so to speak to the Gerber LMF knives, because basically it’s a scaled down version of the larger knife. The Gerber Prodigy Survival Combat Knife is MIRS (Military Integration Resource System) Compliant. The sheath is also MOLLE compatible. 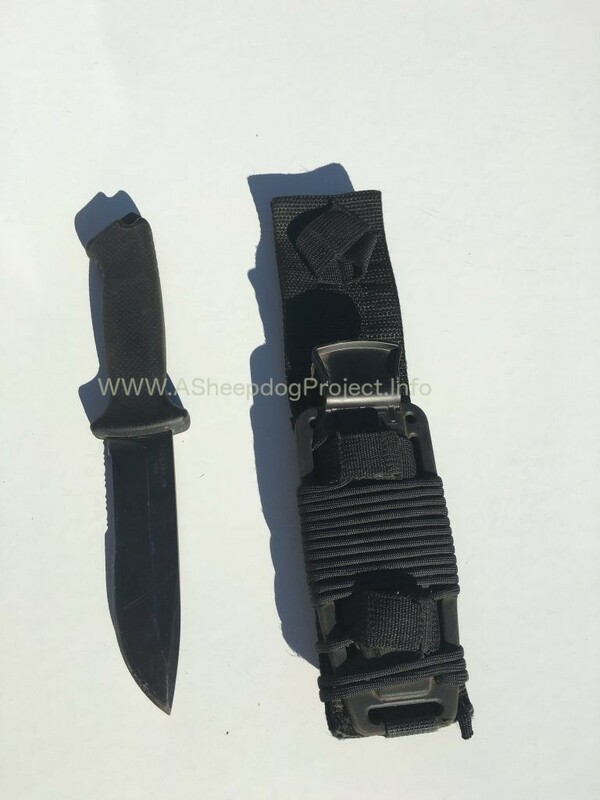 The nylon sheath comes with a leg strap that buckles and additional straps for securing it to anywhere you want to carry it. 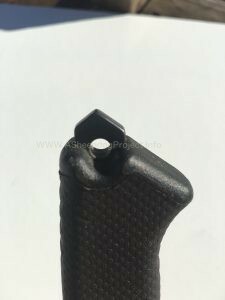 The sheath is secured to the Nylon with two screws and a strap at the bottom as well as two hook and loop straps that wrap through and around the hard plastic section. One feature that I like about the sheath is the friction release thumb lock which helps keep the knife nice and secure. I used to think that any knife with serrations was a cheap knife and the only reason for the serration was because the manufacturer used cheap steel and the knife wouldn’t hold an edge. I now know that good quality knives with serrations made from high quality steel increases it’s effectiveness when they are serrated! The first half of this knife has a serrated edge. It’s sharp, I’ve hacked through green tree limbs, seasoned lumber as well as many other materials and it performed well. I can tell you that it takes quite a bit to dull the serrated edges of this knife. Serrated edges are a must on Survival Knives in my opinion now because the options for what you can cut and hack with a knife in a survival situation increases greatly when your survival knife has a serrated edge. The Gerber Prodigy has a black oxide coating for corrosion protection. It also dampens any shine that could give a person away in a combat situation. The end of the handle comes to a pointed steel tip. You can use this to puncture certain materials or break glass if need be in an emergency. If you need to do this I would have it in the sheath instead of holding the blade for what I think are obvious reasons. *This is a solid knife. In the short time I’ve had it I have given it a beating and it’s still in good shape. *It has a nicely squared edge on the back of the blade that works well with a firesteel. *The handle has a good grip even when wet. 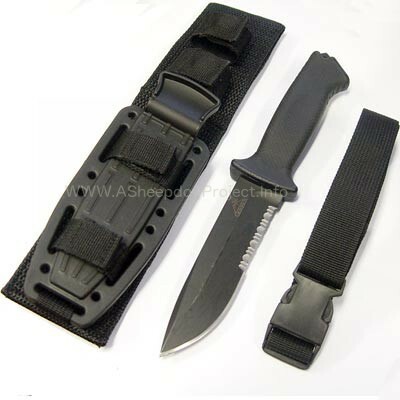 *It came with a very secure sheath that can be worn horizontally or in the drop down style. 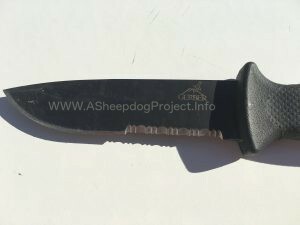 There’s not much about the Gerber Prodigy survival knife that I would change except that I would add a drain hole at the bottom of the sheath. 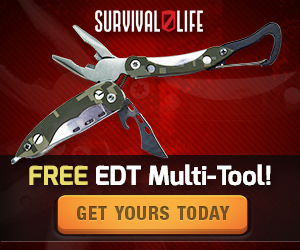 It’s a great survival knife and I carry one on most of my camping and hunting trips. 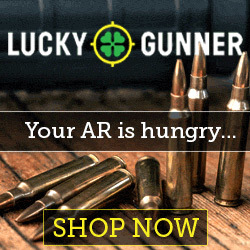 I believe if you’re wanting a knife strictly for tactical or combat purposes, there are better choices out there. But for overall use, you’ll be hard pressed to find another knife and sheath combination that will beat the Gerber Prodigy Survival Combat Knife. Let me know what you think.